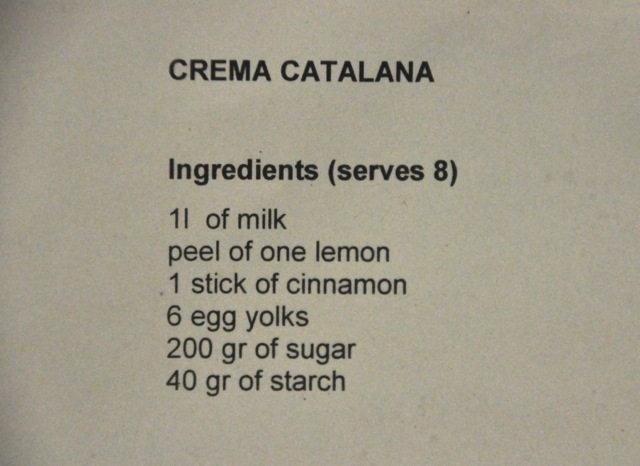 Let me interrupt my on-going blog on Britain, just recently started, and jump ahead to share with you this cool cooking class we took – in Barcelona, Spain. My, we do get around, eh? Well, we’re here for several reasons – it’s warmer here, for one – but mostly we’re here because there are travel restrictions on how long you can stay in different parts of Europe, so we have to move around and play this silly traveling game. A real pain for us long-term travelers. While walking down a narrow twisting alley in the barrio (the Gothic Quarter) of Barcelona, intentionally lost, we came upon a cooking school (Cook & Taste, http://www.cookandtaste.net). Opportunity! The food in Barcelona is really, really good, but in addition we had fallen in love with an Andalusian dish in Malaga, Spain (post of 7/10/13, “Malaga, Costa del Sol”), called berenjenas con miel, or eggplant with honey, a version of which we had found here in Barcelona. Could they show us how to make that dish? Sure, next week. And sure enough, next week it was offered, and here we are! This is what we learned. Disclaimer – things move fast when cooking, so many pictures are not in good focus. 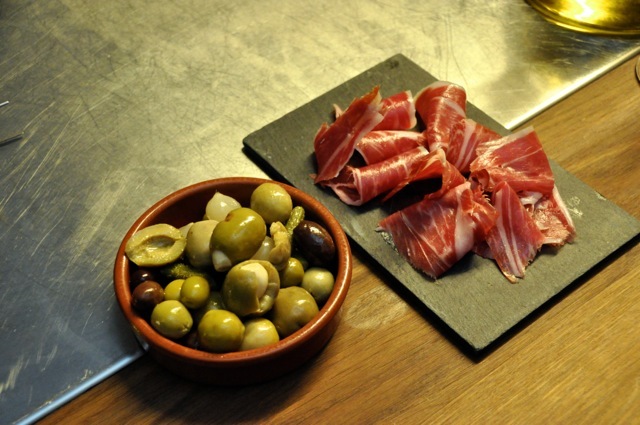 ham) – and it goes really well together! It’s also really simple to make! Start with toasted bread, rub it lightly with garlic, cut a small tomato in half and rub one of the halves over the bread (a little garlic, a lot of tomato), drizzle with olive oil, sprinkle with sea salt, cut to a good size (in this case 4 slices) and you’re ready to chomp. It’s great with appetizers. (shown above). the corn starch and sugar in a bowl until the sugar is completely dissolved and the mixture becomes foamy and almost white. Bring the milk mixture just to simmer again, and very slowly pour the mixture through a strainer into the egg mix, whisking to avoid cooking the egg; whisk all together. Pour mixture back into the saucepan and cook over low heat, stirring vigorously all the time with a wooden spoon until the cream thickens and one can make a line on the back of the spoon, as shown. Pour into traditional terracotta dishes before the cream cools down. Shake and tap to level the cream. Place in refrigerator to chill. couple of minutes. Add fruit for presentation, then have at it! eggplant slices with a paper towel to remove the milk. Dredge eggplant slices in the flour until thoroughly coated, lightly pressing if necessary to help the coating adhere, and gently shake to remove excess (the idea is to produce a very thin coating that will become crisp when fried). Drop the floured pieces into the 170° C oil. Only do a few at a time (our pan dictated 4). Submerge, separate and turn slices in the oil with a slotted spoon until they begin to brown (golden brown), 1-2 minutes (or longer). Transfer the chips to paper towels to drain. Sprinkle with coarse sea salt. Repeat for remaining chips. Cut cubes of goat cheese. 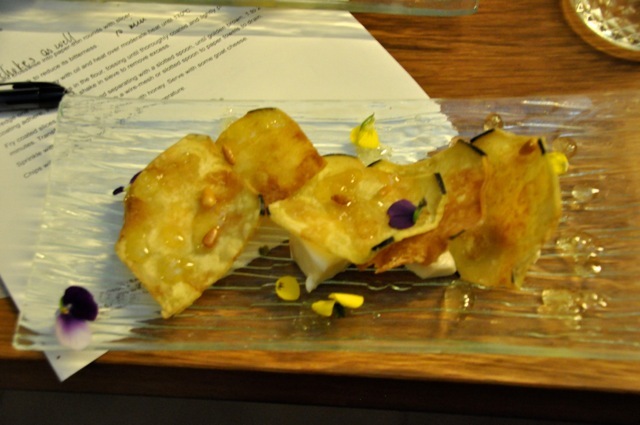 Place chips over cheese squares, drizzle with honey, and add toasted pine nuts and a presentation item (Davíd used viola flowers). Fight for your share. 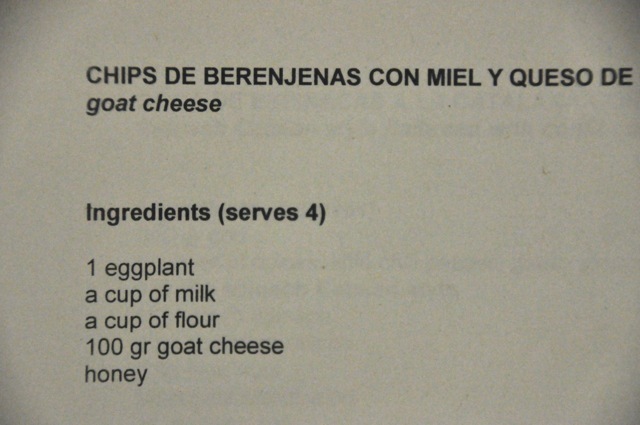 In Andalusia, the dish was a little different – no cheese, and they used a molasses-like cane sugar instead of honey. Both are good! fried. They fry quickly! Drain on a paper towel, sprinkle with sea salt, and they’re ready to go. Thanks Davíd, they were great! sprouts and chopped pistachio nuts. Ready to eat! It was good, but next time I would add some sea salt. For the flatbread, work all ingredients as a normal bread dough. Let it rest until if rises for 1 hour. Meanwhile, warm the oil in a saucepan, remove from heat, add the bouquet of spices (whatever you want), and let infuse for awhile. When the dough is ready, roll it out, trim to a rectangle, and cut it to size. Place the pieces on parchment on a tray, and brush with the infused oil. Cover with parchment, put weight on the top (another baking tray), and bake until golden brown (180°C, 10 minutes). Brush with infused oil again. raisins and pine nuts. Davíd also added a dollop of reduced raspberry balsamic vinegar on the side. It came from a bottle, and was a nice addition to the flavors. I would have added a little sea salt. as shown. Cook the fava beans, drain and let cool; remove the outer skin. Soak the clams in salty water and then rinse. Check that the clams and mussels are alive (if they are open, knock them on the table and discard if they stay open). De-beard the mussels and clean their shells (we scraped them with a knife). Clean the squid interior by scraping with a paper towel. Cut the squid into squares, about 1.5 inches. 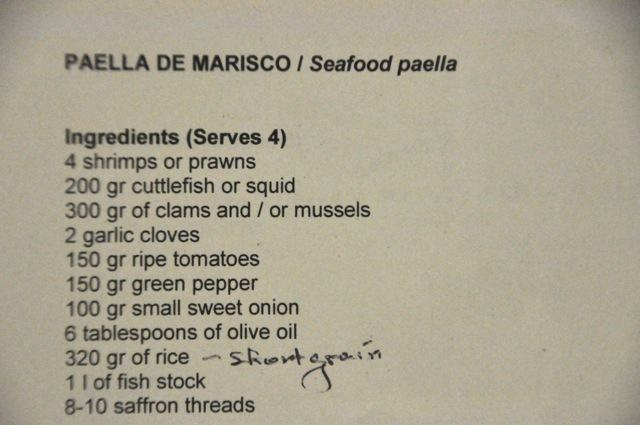 If desired, trim the whiskers off the prawns. and remaining pepper slices, stir, and cook for a few minutes. Add the rice and stir well to coat, a minute or two. Flatten the food to a layer, with no holes. Add the saffron to the boiling stock, then add the stock slowly to the preparation. Do not stir! Rice can’t be touched beyond this point! minutes to steam (the notes say only “stand for about 5 minutes before serving” [no mention of a cover]). For Davíd, wanting rice with some dryness, if the rice is done and there is still some water, he doesn’t cover or he covers with a cloth to let the steam escape. One could cover with aluminum foil to keep the rice wetter. You’re ready to go! It tasted every bit as good as it looks. Well! Hope you enjoyed this diversion from our travel blog. The next post will be back in England, visiting the fabulous city of York. 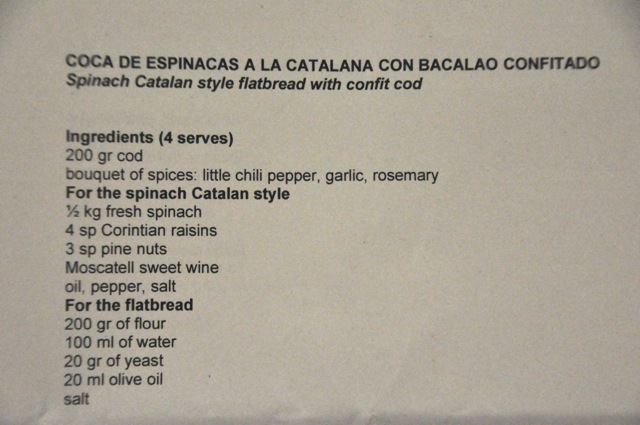 This entry was posted in Barcelona, Spain.